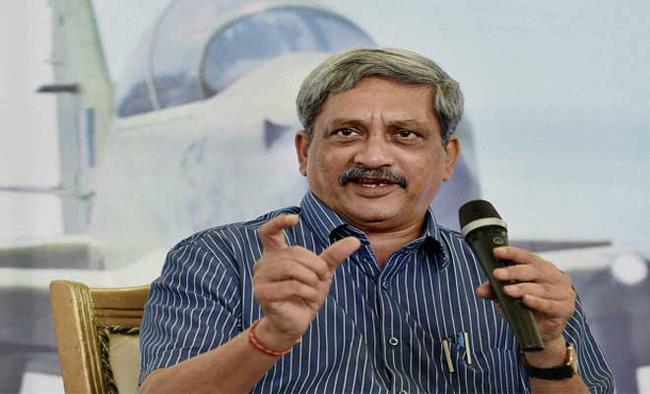 New Delhi: Defence Minister Manohar Parrikar on Tuesday said a new line of production for single engine fighter jets will be started in India under the Strategic Partnership model. The minister told the media that the discussions on Strategic Partnership were in the final stage and are likely to be concluded by the end of January. Speaking on the second line of the single engine fighter aircraft, Parrikar said: "The second line of single engine (fighter plane) is also required for which we are looking at the strategic partner route and very soon once the strategic partner chapter is finalised we should start moving in that direction. During the current year the decision.. should be tentatively over. May be few of them will come in ready made status but the rest will be made in India." Referring to the ongoing production of the indigenously developed Light Combat Aircraft 'Tejas', he said: "Tejas has already been inducted and one line (production) or eight aircraft manufacturing per year is already operational in HAL." The minister on being asked about the Strategic Partnership said: "It is in final stage. There are few issues that need to properly recorded. We have done a good job and the strategic partner is likely to be done by the end of this month." Parrikar meanwhile dismissed reports of India thinking of buying more Rafale fighter jets apart from the 36 fighter aircraft that India bought from France under a government to government deal. This comes shortly after former Air Force Chief Air Chief Marshal Arup Raha said the 36 Rafale jets bought by India were not enough and more aircraft were needed in the medium weight category. Raha also said that India needs at least 200 more fighter aircraft in the next ten years.Talking about the indigenous Light Combat Aircraft Tejas, Parrikar said "In fact HAL is gearing up to increase it to 12. Recently, we have taken up a final stage approval for enhancing production capacity to 16 is also in final stage." On One Rank One Pension, Parrikar said: "So far we have already paid the benefits to more than 19,70,000 pensioners. Around 68,000 pension cases were in scrutiny in the month of December. The targeted time schedule was end of December. 13,000 cases are sent to pension dispersing authority." "With that I think almost 99 per cent of the eligible cases will be settled probably by January. One per cent is not being able to trace them, probably dead," the Minister said. OROP for retired Armed forces personnel was announced on September 5, 2015. The scheme took 2013 as the base year to calculate pensions and the date of implementation was July i, 2014. The period for review was kept at five years.